The ATR built at a cost of Rs 1,300 crore in Varavoo Kaval near Challakere in Chitradurga district will have technical infrastructure on 4,090 acres and transit facilities on 200 acres. CHALLAKERE: Defence minister Arun Jaitely on Sunday said the country’s defence preparedness needs to be at the optimal level in view of the security threat posed by the neighbour. 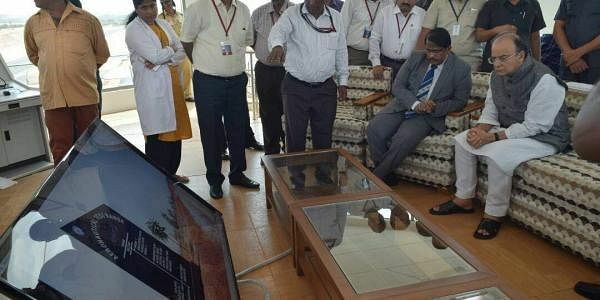 Jaitley was speaking after inaugurating the Aeronautical Test Range (ATR) developed by Defence Research Development Organisation (DRDO) near Challakere in Chitradurga district on Sunday. Stressing on the need for creating homegrown facilities for defence purposes, he said that with facilities like the ATR, India can aspire to become a world leader in defence technology. Earlier, a huge chunk of the defence budget would go towards procurement of defence equipment from foreign countries. But now the approach has changed. The NDA government is in favour of creating optimal facilities within the country, he pointed out. “In the long run, we need to establish facilities to manufacture defence resources within the country. With time, we will be able to these create facilities for defence and other technologies,” he said. Acknowledging Karnataka’s role, particularly Bengaluru, in marking its presence on the global scene in the IT sector, he said research in technology should not just be confined to the IT sector. A large number of nationally acclaimed institutions have come forward to take research in technology to the next level, Jaitley said. The ATR, built at a cost of Rs 1,300 crore in Varavoo Kaval near Challakere in Chitradurga district, will have technical infrastructure on 4,090 acres and transit and residential facilities on 200 acres. The facility will house multiple agencies. Defence Research and Development Organisation (DRDO) has developed the ATR, whch has been partially operating since December 2010. The project faced several hurdles as local farmers had protested against land acquisition for the project. In 2013, work was halted by the National Green Tribunal between August 21 and September 3 after the Karnataka State Pollution Control Board (KSPCB) withheld the ‘Consent for Establishment’ (CFE) application. Later, it gave consent and work resumed.